Put on your dancing shoes for the next LEFF Community Dance on Friday, April 19, 2019 from 7:30 to 10 p.m. Enjoy smooth contras and fast moving squares to the tunes of The next dance is April 19, 2019. Enjoy smooth contras and fast moving squares to the tunes of Mr. Haney – Ken Roby on fiddle, banjo and mandolin; Laura Lewis on fiddle and feet; Jim Eisenberg on claw hammer banjo and hambone; Jim Richards on guitar; Nancy Tozer on bass; with caller Lynn Frederick. 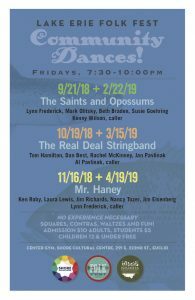 The dance, presented by the Lake Erie Folk Fest, will take place in the spacious, wood-floored Center Gym at the historic Shore Cultural Arts Centre in Euclid. Share this flyer with your friends! Try it, you’ll like it! All dances are taught; no experience necessary. Admission is $10 adults, $5 students; 12 and under free. Lakeshore Coffee House will provide concessions for purchase. Check here for directions and great local places to chow down before (or after) the dance. The Shore Cultural Centre is located at 291 E 222nd St, Euclid, OH 44123. For more info, email LakeErieFolkFest@gmail.com or text/call 440-487-1418. Lake Erie Folk Fest Community Dances are a co-production of The Shore Cultural Centre and the Northeast Ohio Musical Heritage Association. The Lake Erie Folk Fest is a collaboration of the Northeast Ohio Musical Heritage Association, which also produces the Blue Sky Folk Festival, and the Shore Cultural Centre, a former high school turned innovative arts center in downtown Euclid. The festival brings together two communities in a late-winter cross-pollination of the arts: Euclid's diverse arts community, and Northeast Ohio's traditional roots music community. For more information please contact Laura Lewis via email, or call Shore Cultural Centre, 216-289-8578. NEOMHA produces both the Lake Erie Folk Fest and the Blue Sky Folk Festival, whose ninth annual music festival will be held at the Fine Arts Association in Willoughby, Ohio on August 17, 2019. NEOMHA's mission is to provide venues and opportunities for the performance, sustenance and preservation of folk music in our region. 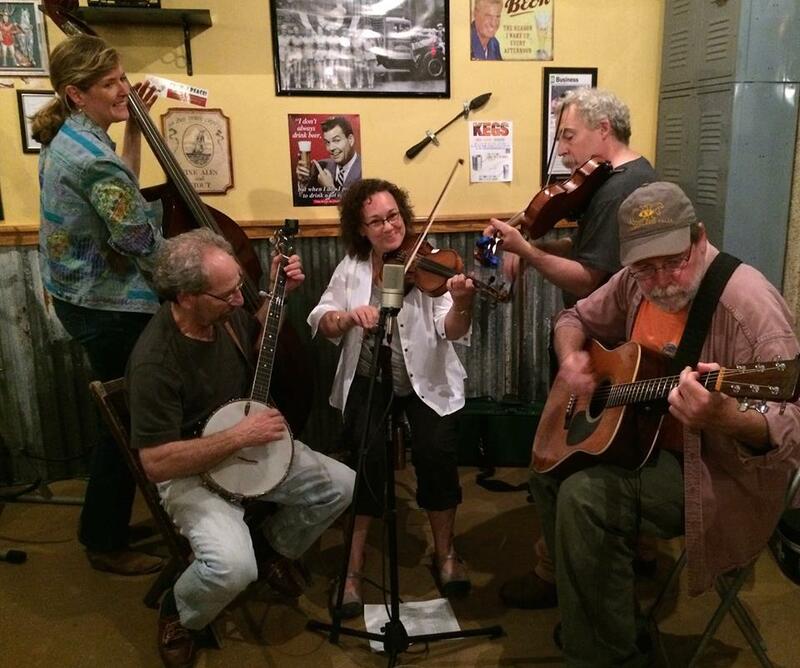 Our goal is to create experiences that inspire a personal love and appreciation of folk music. At the heart of downtown Euclid, Ohio, the Shore Cultural Centre offers a wide range of cultural and educational programs and events. The center's historic building is home to art studios, businesses, and organizations, as well as the Euclid Farmers' Market on Fridays from May through October. Silhouette Productions and other community theater groups perform in the center's spacious auditorium. Shore also has a variety of spaces available for public rent, from party and meeting rooms to an 850-seat auditorium and gymnasium. We invite you to sign up for our enewsletter here! Volunteer! Make a donation! Become a sponsor! Get involved to support this FREE to the public day of workshops, dancing, performances, jams and children's programming, topped by an affordable evening concert. Help support this event and bring great folk music to new audiences. Thank you to the many fine folk who contributed to our Indiegogo campaign! Copyright © 2019 Lake Erie Folk Fest. All rights reserved.